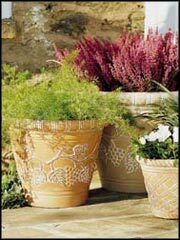 Planters are decorative and functional containers for all types of plants, vegetables and herbs. Seeds and plants have been especially developed for planters and container gardening. There are a large variety of sizes, styles and colors to choose from. Planters can be made from a variety of materials, including stone, terra-cotta, plastic, resin, wood, metal, and clay. There are planters that are suitable for any type of garden, yard, deck or patio. Some planters come with seeds and soil, and most are easy to set up and maintain. Self watering planters are available for the busy gardener, or for those who travel. Some planters are especially designed to fit balcony or fence railings. As new materials are developed and innovative products are designed, gardening and container growing can be made available to just about anyone that wants to grow their vegetables, herbs or flowers. Planters can add a very unique and decorative addition to any area that you wish to add plants and are easy to care for.